One year ago (more exactly on the 12th of May) I arrived back to Romania after traveling uninterrupted for 5 months and with interruptions for a year and a half. 2014 was a wanderlust factory with travels in Peru and India, with the 3 peaks challenge in UK, with my work taking me to USA, Faroe Islands and Norway, and my last trip at work seeing the northern lights for many many nights during the 5 weeks on the boat, with travels to Italy, Germany, Moscow and Prague. From the beginning of the year to the middle of it I grew an idea in my head, that I want to travel the world and either skip a trip or take a sabbatical year. When you wish something first you have to imagine it and the universe will harness the energy to take you there and find means for you. Mid year I got whispers about the opportunity to take a salary package and leave the company. I wrote an email to the management to tell them I want to take the money and one to my friends to tell them I want to make a round the world trip. After few months the company granted my wish and terminated the contract. I didn’t took the round the world trip but I designed one changing many plans and finding flights deals. 2015 started with a cruise in Antarctica and an idea of a trip from Antarctica to Alaska, which I abandoned at the end of the year, after traveling to Chile, Argentina, Bolivia, Brasil and Uruguay. Spent Christmas with family in Germany and by New Years Eve I was in South Africa. After a month there I traveled to South East Asia for few months, Japan and New Zealand. And then I came home. Although the meaning of home is quite different now for me. I came back to Romania. Moneyless, actually already in debt, with 10 kilos more, with all sorts of dreams and no certain idea about what I want to do and how to get to support myself, while doing something which makes me happy, is ethical, according to my values, makes a difference and pays enough for me to travel and follow my passions. I still don’t have a certain idea. While traveling, every time I was thinking about what to do when finishing money and coming home, I was getting frustrated and tense and I was focusing on something else, delaying the moment when I had to make real decisions. But somehow I had this feeling that something great will happen, something good is coming my way. On my flight to Romania I was so happy. Sad to leave New Zealand but happy to take a break from hostels and have real good sleep, my room, privacy, to see my family and dog, to speak and party with my friends, to eat all the delicious romanian food, to trek those beautiful romanian mountains. My first morning home I woke up and it was bliss, it was quiet and the light coming in the room was so beautiful. The smells, the birds outside, mom smiling, dog on the back for me to scrub her belly. Bliss. The next day I had the reunion with my high school colleagues to celebrate 10 years since we finished school. And I was looking forward to it and I was happy to see my colleagues, many of then first time after graduating high school. Just that my dress was too small for me now, with 10 extra kilos. And my colleagues were asking me what will I do next. Obviously, with good intentions and looking forward for my adventures. For me, that day started a long story of frustration. I had just one beautiful relaxed day home. And too many months of being sad, frustrated and then depressed. I had a good job opportunity, actually a real help which I’m grateful for, but after two months I left because I couldn’t do it. In my mind was all this amalgam of thoughts that I don’t want to stay in one place, that I couldn’t focus, that I was unhappy, that I wanted to do something else with my life. Then I decided to visit my sister in Germany. She was a generous host for more than a month but I became restless and went back to Romania. I got the TEFL certification to teach english as a second language aiming for Japan or South Korea, but couldn’t find a job there because they want natives or people with experience. I felt very frustrated because I spent the money for the course for nothing and that I should have known better. Meanwhile, I hated the way I looked, I was broke and preferred to stay inside the house instead of meeting people. I had an interview for a tour leader job in Norway and one for a volunteering project in Iceland. None of then chose me. And I became less confident and accused myself of being too introvert, of saying wrong things. I was trying to build something and I found so many obstacles. Most of them mental. Just had nowhere to look for an example and no moral support. For a while I made a plan and I was just waking up early, trying to be productive and exercising. I started to eat healthy but then Christmas happened. All the 5 kilos I worked so hard to lose were back. 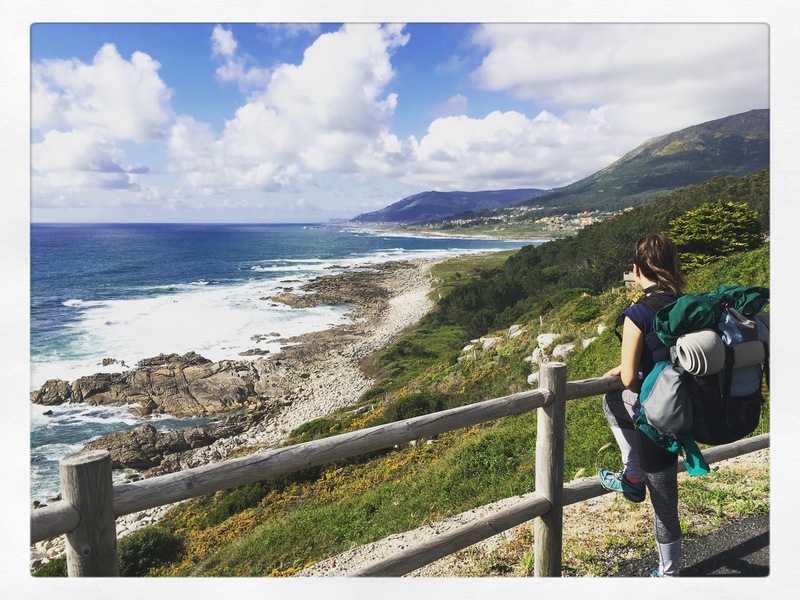 And then one day I decided to go to Lisbon, to volunteer in a hostel for 3 months and after to walk Camino de Santiago, something I wanted to do since long ago. And that was the best decision I took in an entire year. Because I became again happy, hopeful and started to love myself again. I lost 8-9 kilos, but most importantly, I got to know my body better. I met inspiring people and made connections and friendships. You have to take two steps aside and look at things differently and then they become clearer. When I was down I was consuming myself for allowing me to be down. To be confused, slow, sad, uncertain, to feel different than expected, to say no when everybody expects me to say yes, to leave when expected to stay. I was so good at making myself feel worse. And also to keep all inside. So I had to go back traveling. To see everything from a different perspective. This is actually a happy story. Time flies so fast. My last year was a year of struggle and lessons. And I still don’t have all the answers, nor a solution for my financial independence. What I have is more peace. And more strength. I learned to accept myself more. To not put myself down so easily. To breathe. To have way less expectations. To be less stubborn but firm in my quest. To care less what other people think. Not to let people increase my frustrations or put theirs into me. Not to expect suport from people around when they will see just their perspective. To accept things need time to settle. And I need time to find my way. There’s no shame in not having all the answers.